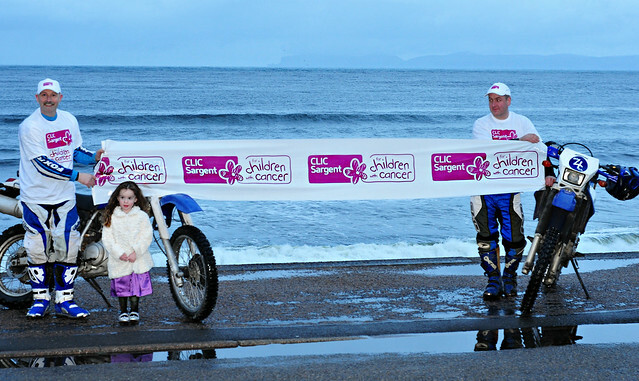 Two Caithness trial bike enthusiasts kick started a challenge today which will see them raise money for the UK’s leading children’s cancer charity, CLIC Sargent. Paul Steven, 37, and Colin Leask, 49, commenced with a ride on the shortest day of the year. They were flagged off by four-year-old Faith Marshall, from Thurso, who they met up with at Thurso beach yesterday, along with her mum Natalie Marshall. Faith, who has been receiving treatment for cancer over the last three years, has inspired the bike enthusiasts to raise as much as possible for the charity which supports so many families in similar situations. The challenge will put both men through the paces of endurance bike riding, testing their skills, stamina and fitness by completing the Ride 4 Life challenge to Vietnam. They hope to complete this in January 2013. Last edited by kara; 26-Jun-12 at 10:27. Last edited by kara; 26-Jun-12 at 11:38. Looks like a good charitable effort. My departed wife passed on due to ovarian cancer. I support these efforets. Last edited by kara; 30-Jun-12 at 08:14.